A rendering of the proposed hotel near the corner of Zelzah Avenue and Nordhoff Street. The design takes into consideration CSUN's historic orange grove and pond. 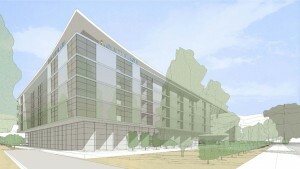 The hotel would serve the campus and the surrounding community. Now serving nearly 40,000 students and with thousands of visitors coming to campus each year, California State University, Northridge officials saw a clear need to develop a hotel to serve the campus and surrounding community. To that end, CSUN has signed a letter of intent with Jupiter Realty Company to develop a Hyatt Place Hotel, which would include restaurant and conference space, on the campus in the heart of Los Angeles’ San Fernando Valley. CSUN hosted a series of informational meetings yesterday, inviting the campus and local residents to learn more about the project. Once built, the hotel will provide CSUN the opportunity to house students’ visiting family members and alumni, host campus events and programs, and support the academic and business communities, locally and outside the region. A view of the proposed hotel from the perspective near the corner of Zelzah Avenue and Nordhoff Street. Construction of the project is expected to begin in early 2018, pending final approval from the California State University Board of Trustees, and cost about $52 million. It will be funded entirely by the developer. University officials estimate the project will be completed in late 2019, and it will generate increasing annual revenue for the university over the life of the agreement. The hotel will be located on 2.75 acres of land at the southeast corner of the campus at Zelzah Avenue and Nordhoff Street. The land currently is occupied by CSUN’s Orange Grove Bistro, which was built in 1973 and is not able to meet the current needs of the campus. The project will be built directly adjacent to CSUN’s orange grove and pond. 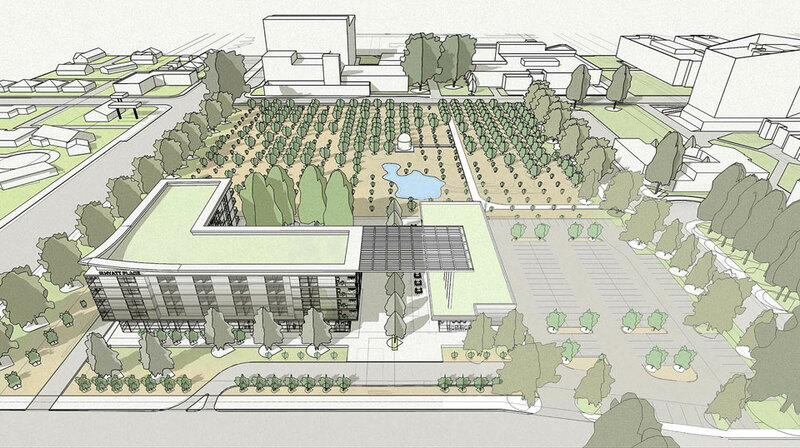 The international architectural firm Stantec has spotlighted the grove and pond in the project plans, and the design features outdoor space that opens into this unique campus feature. The hotel will have 148 rooms, 1,800 square feet of restaurant/food service space and 3,000 square feet of conference/event space. It will be operated by Hostmark Hospitality Group. The adjoining, full-service restaurant will include 6,600 square feet for a dining room and bar. The restaurant will offer three meals a day, seven days a week. The restaurant’s operator is yet to be determined. The development will include 195 parking spaces, all of which will be adjacent to the hotel. University officials have been considering adding a hotel for about two decades. The effort picked up momentum a couple years ago, after a market analysis report — conducted by PKF Consulting Inc., a unit of the Los Angeles-based commercial real estate firm CBRE — concluded the project was feasible. Currently, out-of-town visitors to CSUN do not have easily accessible accommodations. This project will serve students’ family members, visiting scholars, alumni and others visiting the campus throughout the year. In addition, it will support the growing success of CSUN’s Valley Performing Arts Center, located just a few hundred feet west of the planned facility, and the university’s 19 NCAA Division I athletics teams. The hotel also will offer CSUN students majoring in tourism, hospitality and recreation management internship opportunities to help them gain valuable experience.